The Philidor position is an important position in chess. It arises in the endgame at the time in which the climax of the game arrives. This kind of chess endgame actually gives a drawing strategy when a defender has a king and rook vs a king, rook and pawn. The Philidor Position is also called as the Third Rank Defense. It is called so because of the importance of the rook on the third rank cutting off the opposing king. This endgame was first noted and analyzed by Francois-Andre Danican Philidor in 1777. This position is one of the most frequently occurring positions in endgame strategy. 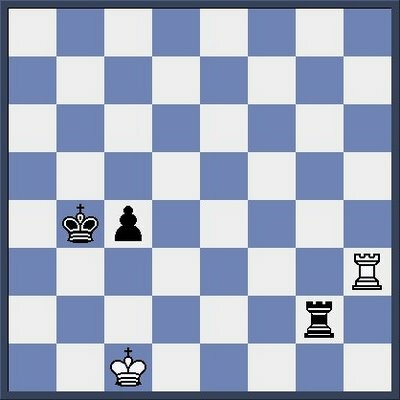 The defending king (White in this diagram) is on the queening square of the pawn (or adjacent to it). The pawn can be on any file. The opposing pawn has not yet reached the defender's third rank (it's sixth rank). The opposing king is beyond the defender's third rank. The defender's rook is on the third rank, keeping the opposing king off that rank. Maybe it's an old strategy but it's a 100% reliable strategy to defend in this kind of endgame. Thank you Mr. Malik to bring my attention to this area of the chess game, and I find the Philidor Position a very strategically important theme especially in the final steps of the game, as it makes chess more competitive. Thank you Malik for bringing this technique to our attention. I am always glad to surprise my opponent with tricks like this to change the outcome. It's great to even get a draw from what seems an uphill struggle. This position is mentioned here as one of the most frequently occurring endgame positions. It just keeps cropping up. We should all thoroughly study and practice these positions and the related moves. Malik you make a difficult concept for beginners so easy to understand. We can bring about and play the Philidors Position with confidence. These endgame building blocks are what the novice needs to master in order to progress. The overall content was interesting. Thank you for sharing. Being new to the chess game, I don't know these little techniques so well. I'm slowly learning several ways to play in the endgame, including the Philidor Position. I certainly didn't know that there were not 1, not 2, but 3 seperate Philidor Positions! an interesting strategy. Endgame tactics like this can be neglected by those who emphasize defeating the opponent in a sweep, but when playing a closely matched opponent such knowledge can be invaluable. All three Philidor Positions are interesting methods to prevent defeat by keeping your rook active. You must not let that enemy King on to your third rank. When you understand these techniques and others like it you can consider yourself an intermediate player. Join in and write your own page! It's easy to do. How? Simply click here to return to Playing Philidor Position Endgames.